Young Bullets Looking to Take their Shot in 2018 Campaign | The Gettysburgian. 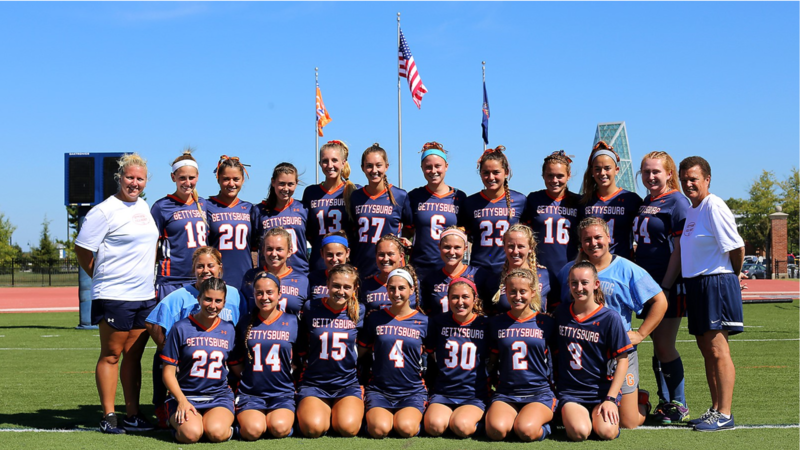 The Gettysburg College field hockey team will be reined by a squad of mostly underclassmen this fall, with only three juniors and their senior captain Brooke Matthews. Despite their youth, the Bullets hope to compensate their lack of experience with tenacity and determination. Sophomore mid-fielder Emma Bertrando (West Chester, PA./Henderson) praised Coach Barb Jordan for her encouragement to the younger players on the team. The returning upperclassmen include defensive captain and senior Brooke Matthews (Rye, N.Y./Portsmouth) and juniors Julia Soares (Barrington, R.I./Barrington), Sam Nicol (Califon, N.J./Voorhees), and Jillian Caputo (Haddon Township, N.J./Haddon Township). Matthews is a returning starter looking to guide her young team to victories this season. She tallied 9 defensive stops last season and looks to stifle competition at the net this fall. Julia Soares was a second-team All-Centennial Conference selection out of the mid-field after tallying four goals and an assist in her sophomore season. Sam Nicol is looking to contribute on the offensive side of the ball this year, while Jillian Caputo has eyes on filling the void in the cage left by first-team all-conference performer Haley Mowery who graduated this past spring. The Bullet’s youth should not be taken as a weakness, as returning sophomores Emma Bertrando and Allison Cavicchio (Medford, N.J./Shawnee) have big plans this fall. Bertrando, started every game and led the stat sheet last season, posting 15 points with 7 goals in her rookie season, while earning second team all-conference accolades. Cavicchio also had an impressive first season, tallying three goals, including a game-winner in double-overtime against No. 15 Ursinus College. Other young players looking to find their roles on the field are sophomore mid-fielder Grace Torrance (Lancaster, Pa./Manheim Township), sophomore forward Megan Kratz (Robbinsville, N.J./Robbinsville), and sophomore mid-fielder Tamlin Unruh (Moorestown, N.J./Moorestown). Sophomore forwards Arden Scheetz (Phoenix, Md./Notre Dame Prep) and Isabel Miller (Lancaster, Pa./Lancaster Catholic) each appeared in all but one game in their freshman season last fall. On the defensive end, the Bullets are replacing former starters with Matthews and sophomore skillman Maeve Dwyer (Skillman, N.J./Montgomery), who started the final 13 games of the 2017 season. Gettysburg’s schedule is difficult this year, with competition from both non-conference and conference opponents. Their non-conference play includes contests with No. 15 Catholic University on Sept. 5 and national runner-up Messiah College on Oct. 3. The Bullets open their regular season at Shenandoah University on Friday, Aug. 31, at 7 :00 p.m.